Jo Cox MP. She believed in a better world. We should be better than this. I had never met Jo Cox MP. I am ashamed to say that until Thursday I had not heard of her. Yet her murder has left me and millions of people in the UK and around the world reeling from shock and sadness. Shock also at how deeply it has affected me. I am devastated. This does not happen in the UK. This is not who we are. This is not who we want to be. A self-confessed Yorkshire lass, only three years older than me, Jo Cox’s constituency is only five miles from Bradford. Representing the constituency where she grew up, she was a local lass made good. An MP for only a year, she was considered a rising star in the House of Commons, a passionate campaigner for her constituency and for human rights. Distraught fellow MPs have described her as bright, full of energy, enthusiasm and fun, dedicated to her family and constituents. I worked for an MP in the north of England for five years. I attended many surgeries such as the one Jo Cox was on her way to when she was attacked. I know how vulnerable MPs and their staff can be. We operated an open door policy in our constituency office. MPs rightly feel that they should be accessible to their constituents. I still have friends who work for MPs both in their constituency offices and in Parliament. I have friends who are local councillors working in very similar areas and who dedicate huge amounts of their time and energy to their constituents. There has always been a certain amount of vitriol directed towards politicians and I would be the last to recommend a return to deference, but recently it feels something has changed. On Thursday I had been watching a report about how immigration had come to dominate the Brexit campaign. The visible anger on the streets, while not exactly new to me was both shocking and depressing in its venom; and then came the news of the shooting. Whatever the motives of the attack, (although it seems hard to deny it was a politically motivated hate crime) it feels like a terrible culmination of rising and repulsive tensions. A wave of hatred, frustration and bitterness that has been allowed to fester, encouraged to find a voice and now worse. My one hope is that this horrific act will cause people to pause and ask themselves what sort of country we want the UK to be. 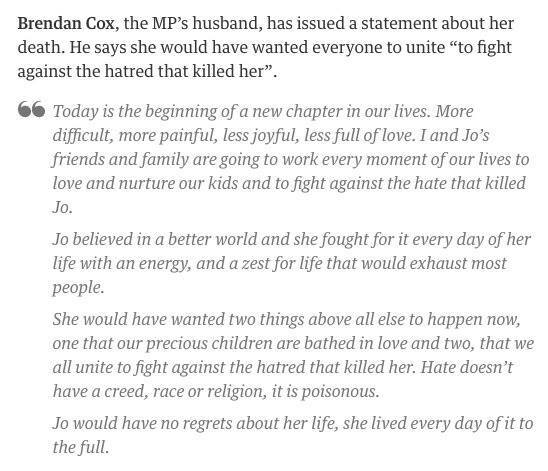 Jo Cox’s husband’s statement released shortly after her death is almost unbearably moving and calls on us to unite against the hatred that is trying so desperately to divide us. That at such a time you could find the words to show not only your love for the woman so cruelly taken from you, describing the essence of who she was, but also to celebrate that she made the very, very best of her all too short life is incredible to me. 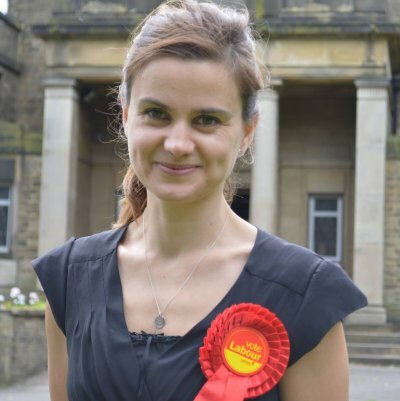 In her maiden speech as an MP last year, Jo Cox gave a speech full of pride in her Yorkshire roots and in the constituency that she should have represented for years to come. I want to leave the final words to her, to hope that it inspires us to be better. Next Brexit for dummies. It’s not the economy stupid. Hope not Hate as that should be the message. I saw her give a speech. She seemed to be just the kind of person we need in Parliament. That is lovely. Thank you. Her husband seems a very strong man. She worked at Oxfam with Josh who was our Parliamentary candidate last year and he has nothing but good to say about her. Thank you Pam, I wanted to write something but wasn’t sure that it would come out right so I really appreciate you commenting. So desperately sad for everyone who knew her and her family and the wider community in Batley and Spen. Positive things are coming from this murder but such a pity it takes a tragedy for us to reassess and remember what is important, not least how out of control and bitter the referendum campaign was becoming. Good to see politicians and communities reuniting, sad it has to be in grief. Dear Jenny, it’s good to hear that people are coming together, but as you say so sad that it takes such a tragedy for it to happen. Let’s hope the good people of Batley and Spen do us proud. Thank you so much for commenting.